The supermarkets, though small by international standards, offer a fairly good selection. Lucky Market is the longest running in town, and its branch at AEON Mall is particularly popular. Bayon Market is quite popular for its large selection and specialty imported items. Danmeat is the go-to international butchery in Phnom Penh. Fresh, locally grown, organic/chemical free fruits, vegetables and meat. Shop at the store or order on-line, delivered free-of-charge to your door. Also imported wines, cheeses and specialty food items. One of the largest international supermarkets in the city. Specialty items others don’t carry. Cake art gallery, cupcake emporium. Fair-trade coffee. Popular delishop, now with four locations. Fresh baked breads, pastries, cakes, quiches, snacks, terrines, wines and much more. The original in BKK1, as well as the Tonle Sap Street location offer a full restaurant, air-conditioned dining and French dishes. Dried fruits, jams and pickles made exclusively from Cambodian grown fresh fruit, and produced by people suffering disabilities from landmine injuries. All products made to international health standards. Available at the Cambodian Dried Harvest Fruit showroom, and at stores and shops in Phnom Penh and Siem Reap. Look for the distinctive green label. Wholesale inquiries welcome. International-standard butcher. Long established and very well reputed. Wide selection of meat and sausages. International deli, butchery and grocery. One of the largest and longest running international supermarkets in Phnom Penh. The original on Sihanouk Blvd, 2 blocks east of Monivong. The newest location at the AEON Mall on Sothearos, offering a much larger selection than the Sihanouk supermarket. Italian deli. Imported cheese, meats, spices. Popular western style bakery and deli. Fresh baked breads, pastries, cakes. Sandwiches, salads and soups. International bakery with several locations. Breads, cakes, pastries. Receiving good reviews. Extensive selection of fine wines from around the world. Monument Books is the largest distributor of new English languages books, offering a selection of Cambodia-related titles including the most recent releases. Bohr’s Books has one of the best selections of used and bootleg versions of the most popular Cambodia and SEA titles. 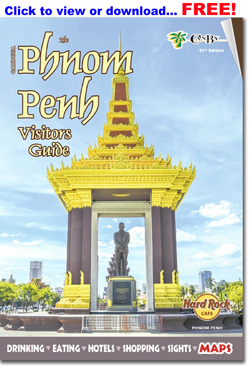 Photocopy books and guides are also available at the traditional markets and roving book sellers that walk tourist areas such as the riverfront. Used and new books. Good selection of Cambodia and Southeast Asia related titles. 8AM-8PM. Phnom Penh's primary new book seller. All the latest Cambodia related titles as well as a large selection of non-fiction and fiction titles. Newspapers, magazines. 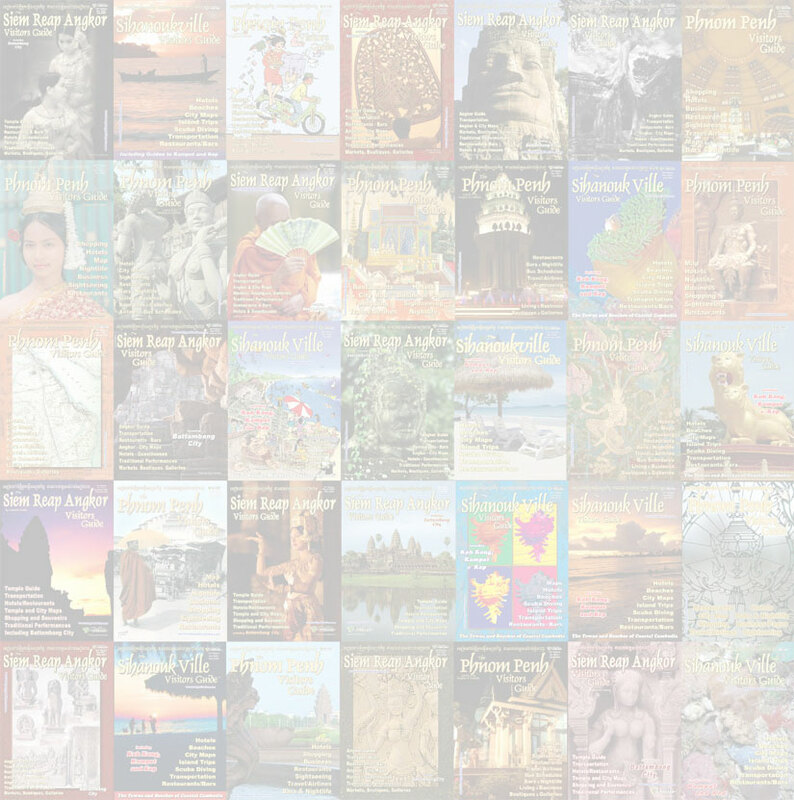 Selling books (English and Khmer) from Reyum Publishing, specializing in Cambodian culture and arts. The video stalls at the Russian Market offer a large selection of DVDs, including recent movies, software and games for a dollar or two per disk. There are also several DVD shops along Sisowath Quay (the riverfront road) specializing in movies and music. An excellent selection of music CDs. Record to iPod and MP3. Lots of funky clothing. i-device uploads from a large catalogue: music, TV and movies. iPods, accessories. Established in Cambodia in 2002. Photo shops are located across the town, all offering digital services and most film services as well. Several dot Street 110 near Phsar Chas and another little cluster on Sihanouk at the corner of Street 51. The shops listed below are some of the more popular and complete. Long established. Digital services and film processing. Equipment, cameras, camera repair. Long established and respected photo shop and studio. Full digital photo services and film processing. Cameras, lens, cards, equipment. Studio and photographers. 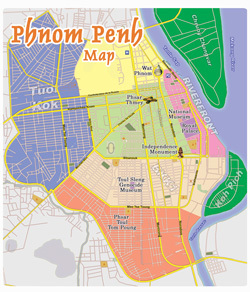 Six locations in Phnom Penh, two in Siem Reap. The distinctive yellow domed Phsar Thmey is a must-see both as a point of interest and as a shopping destination. Offering a wide range of the classic souvenirs and, if you are knowledgeable, it can also be a good place to pick up gems. (Be careful of fake/inferior gems.) Vendors line the entrance selling statuary, silverwork, handicrafts, silks and kramas, carvings and the largest selection of t-shirts and caps in town. The central dome houses an amazing display of jewelry and gems.